It’s Halloween today, so to make this post especially spooky I’ve had to put this freaky fungus in. And what a fantastic name it has too. Dead Man’s Fingers (Xylaria polymorpha) grows on dead wood (usually beech & sycamore) throughout the year, and is very common. 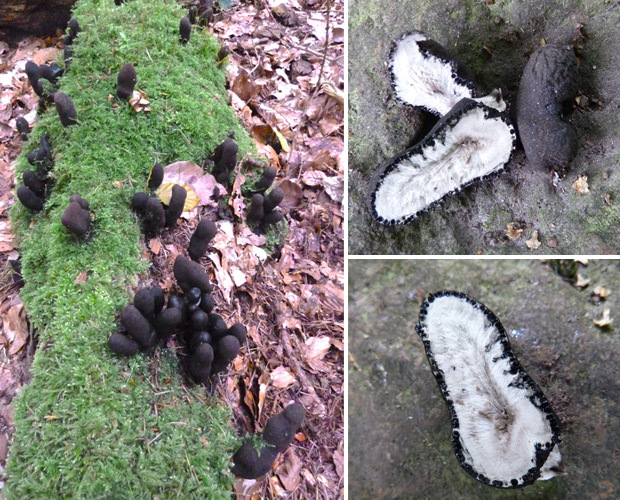 The fruiting body is black and irregularly club shaped, often in small groups. It’s of a small(ish) size, reaching up to 8cm in height and up to 3cm in diametre. It’s hard outer shell protects the white flesh within where the spores are produced. As you can guess this fungus is quite inedible and I don’t think anyone would fancy a nibble anyway! But the best thing about it is it’s strange general appearance. As you can see in the picture below there’s a small group of them growing on dead wood. If you look at the two on the far left, you can see where they get their common name from. Spooky! Dead Mans Fingers – reaching out from the grave? A large collection of Xylaria polymorpha on the moss of dead wood (left). A Dead Man’s Finger cut in half exposing the white spore mass inside. I have dead man’s fingers fungi in my backyard! Good stuff. Let’s hope they are the fungi and not the real thing!!!! I found a clump of these about 1 metre off the ground growing on a living branch of beech. the Beech was covered in Moss with dead mans fingers growing out of the moss. Do they also grow out of the ground?? They can appear to grow from the ground, but in fact they are feeding off the dead wood underneath. They only grow on dead wood of deciduous trees (usually beech) so the tree you must have found was probably dead but still standing or it could have been a different fungus.